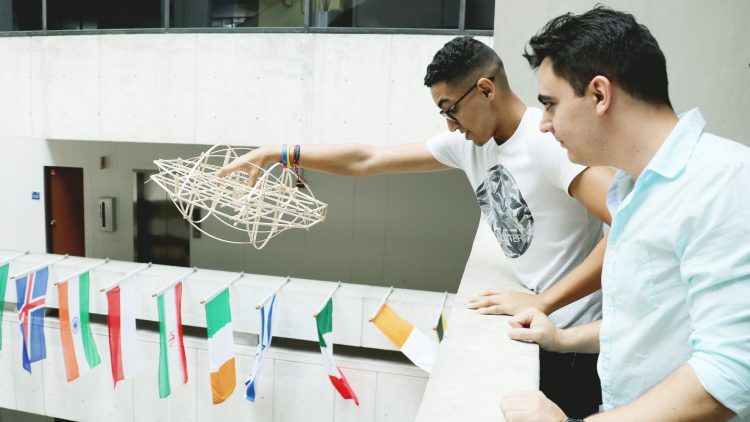 Students test their design theories in Building 1 at MDC Wolfson Campus. Earlier this spring, curious onlookers began to gather in the atrium of Building 1 at Wolfson Campus as students in Professor María Zabala’s Architectural Materials and Methods of Construction course ascended to the second floor. Bearing latticed wood contraptions of yet uncertain purpose, they one by one leaned over the poured cement parapet, tossing their gizmos over the side. The spectacle was not a spring break prank but a test of engineering prowess. In each of the basswood constructions, which the students had designed and built, an egg was gently cradled in the center. One by one the constructions crashed onto the tiled floor of the cordoned-off drop zone 15 feet below. Of the seven prototypes, two delivered their prized eggs safely uncracked, one of which later emerged intact from a subsequent plunge from the fourth floor. The other five were ready for the omelet pan. For Zabala, an associate professor of architecture at MDC’s North Campus, there were serious lessons to be mined from the hijinks. The project imposed strict limitations on the students, who had to use lightweight basswood no more than a quarter-inch thick, and could not employ foam or other kinds of padding for the egg, which was suspended at the center of the designs with rubber bands. Architecture is one of the most visible expressions of who we are and were as a civilization. It’s both a science and an art that reflects our current sociological standing, our aspirations and our values. MDC’s architecture programs emphasize a theoretical approach along with a hands-on methodology. Interested in Architecture? Explore MDC’s School of Architecture.